For the routine I wanted to start with a pre-poo treatment, but I changed my mind – laziness -. In two section I washed my hair using Mizani Moisturfusion Milk Bath Shampoo. I think it’s my third time using this shampoo and I like the fact that is has a milky texture and I doesn’t dry my hair out. My hair feels good after the wash. It’s bouncy and I can easily glide my finger through my hair. Oke this is something new and I wanted to try this method for a long time. – lool I even bought a bottle off apple cider vinegar a year ago – Method is using a mixture of water and apple cider vinegar to rinse my hair. – I will explain what the benefits are – So after washing my hair I rinsed my hair with the apple Cider Vinegar mixture and after that I rinsed my hair with water. When my hair was still wet I directly sprayed Elasta QP Shine and Olive Oil & Mango Butter Leave-In H2 Conditioner only on my ends, nape and edges – they need the moisture – Then I followed up with Cantu Shea Butter leave in conditioning repair conditioner – this product is the truth-. 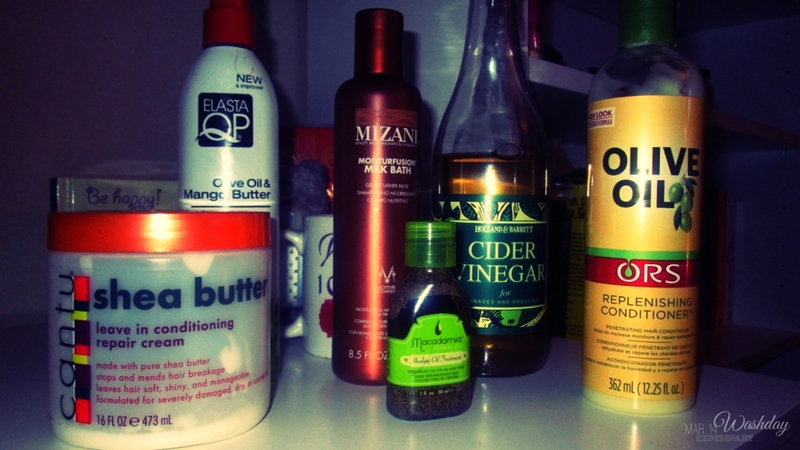 In small sections I applied the product to my hair and sealed with Macadamia Healing Oil Treatment.